The bond amongst Voyager’s familial crew is stronger and more evident than ever before. 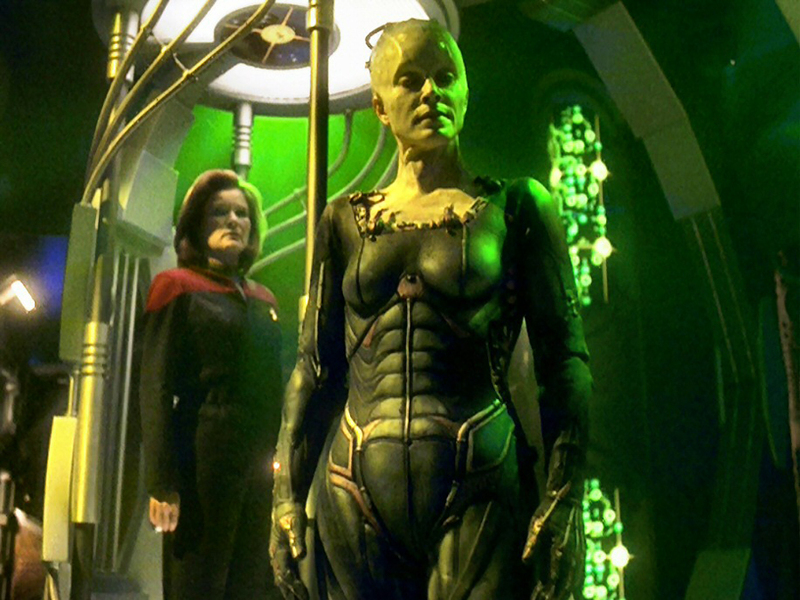 Seven and Janeway’s parental influences are both felt throughout the season, particularly with their relationship with Icheb, as well as Janeway’s role as Godmother to Q’s son. The Maquis-Starfleet rivalry is long since forgotten, although it is explored in such episodes as “Repression” and “Shattered” – both of which tie into past events. The season opens with the conclusion of “Unimatrix Zero.” In its original run, Season 7 also featured another mid-season feature-length episode, “Flesh and Blood,” which sees the return of the Hirogen and examines the repercussions of sharing holodeck technology in Season 4’s “The Killing Game.” The episode also once again examines the equal rights of holograms – a recurring theme throughout the series’ run. The season also sees one other two-part episode, “Workforce,” before its feature-length finale. Q returns, for his last official Trek appearance, in “Q2,” where he deposits his rebellious teenaged son (born in Season 3’s “Q and The Grey”) with Captain Janeway for much-needed parenting. Neelix departs Voyager in the heart-warming episode “Homestead,” where he finds love and settles down in a Talaxian colony. He does return with a cameo appearance via subspace in the series finale. “Shattered” is a good homage to the series’ past, which sees the return of Seska – who was killed in the Season 3 premiere “Basics, Part II” and last seen in “Worst Case Scenario.” The time-fractured episode revisits many past events. The two-hour feature-length series finale, “Endgame,” finally brings Voyager home and deals a crippling, potentially fatal blow to the Borg. Since “Endgame” features the latest events ever shown on the franchise’s canonical timeline (except for the far-distant future), we are uncertain of the Borg’s ultimate fate.